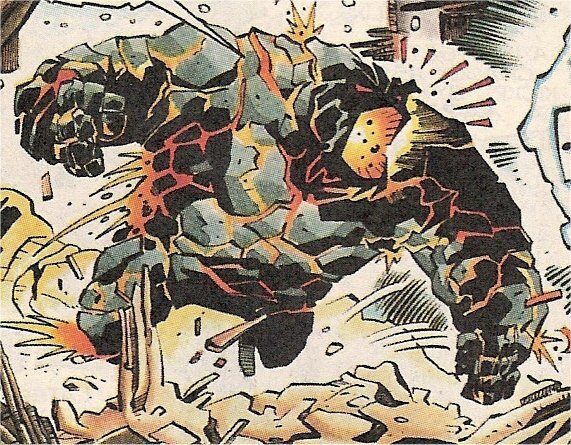 Powers/Abilities: D-Struct can consciously transform himself into a monster composed of living volcanic rock and back again. In his monstrous form, his body seethes with fiery energies that are visible through the cracks in his skin. (It is entirely possible that D-Struct's internal organs are replaced by these energies in his transformed state.) D-Struct's denser structure and internal energies grant his superhuman strength, sufficient for him to easily lift a Buick and pitch it at least a city block. He is also highly resistant to physical harm. D-Struct can explosively release his body's energies beneath him, launching him skyward. Thus, he can fly although his great mass prevents him for remaining airborne for very long. Still, this power helps even the odds when D-Struct is battling aerial opponents like Static. For unknown reasons, D-Struct's fiery energies react violently with the electrostatic energy generated by Static. This feedback is worse for whichever Bang Baby is on the defensive. So, D-Struct's blows inflict more damage on Static's force field than they would otherwise. However, the feedback can also work against D-Struct. (See Limitations.) It is unknown if electricity from other sources would react to D-Struct's bodily energies in a similar fashion. When D-Struct turns into his monstrous form, whatever clothing he is wearing instantly disappears. His clothes will reappear without damage when he reverts to human form. Why this occurs is a mystery. Damon Briggs is a skilled hand-to-hand combatant due to years of streetfighting experience. He also has shown promise as a writer and website designer. Limitations: Because of how their energies react to each other, D-Struct is far more vulnerable to Static's electrical bolts than many other forms of attack. It is indeed possible that Static could kill D-Struct with a sufficiently high voltage though the hero would never dare attempt it. When he reverts to normal, D-Struct is no more vulnerable to Static's powers than any other human being. History: Damon Briggs was born on Paris Island, the poorest and most crime-ridden neighborhood in the City of Dakota. Like many teens on the island, he believed there was no legitimate means to succeed in life and soon fell in with the Paris Bloods, one of Dakota's most notorious street gangs. Briggs started off as a gunrunner for the Bloods, but soon proved to be a fearsome fighter for the gang, who nicknamed him "D-Struct." Naturally, D-Struct was among the Paris Bloods who fought in the Big Bang, a turf war on Paris Island that would determine Dakota's most powerful gang. During the battle, D-Struct and his friend Rocks got separated from the Bloods. They were then ambushed by members of the Double L's gang, who killed Rocks and savagely beat D-Struct with their chains. When it seemed D-Struct would die, Dakota police officers arrived and deployed a special tear gas to help them more easily capture all the gang members. Unknown to the officers, the gas had been secretly laced with "quantum juice," a bizarre mutagenic substance that killed 90 percent of those at the Bang while the survivors, known as "Bang Babies", became genetic freaks. In D-Struct's case, he was transformed into a monster composed of volcanic rock. The distraught gang member thought the change was permanent until he instinctively reverted to normal. Damon Briggs realized he had gotten a second chance and decided to leave the gang life behind, including his notorious nickname. His choice delighted his father, who had desperately tried to convince his son that gangbanging was a dead end. The pair then moved to the working class neighborhood of Sadler, where Damon though he could live in peace and finish his education at Ernest Hemingway High School. However, Damon discovered that his gangmember past made him an outcast among his classmates. Sympathetic, a teacher named Ms. Tring convinced Damon to keep a daily journal, in which he could express and deal with his feelings in a positive manner. Though skeptical, Damon learned writing things down made him view life in perspective, and high school became much more bearable. Months later, Briggs was confronted by some members of the Paris Bloods, who did not participate in the Big Bang. They wanted Damon's help in expanding their gun selling operations into Sadler. He flatly refused and then accidentally changed into his monstrous form when the Bloods persisted. The Bloods fled the scene, but then realized that D-Struct's new powers made him even more useful. Not long afterward, Damon came home to discover his father being held hostage by the Bloods. The gang's leader said they'd return Damon's dad safe and sound if he killed Static, a teen superhero who was disrupting Paris Blood activity in Sadler. Seeing no other choice, D-Struct ambushed Static, who held his own until the former collapsed an abandoned building on him. Though D-Struct could have slain the buried Static, he couldn't go through with it and told an arriving group of Bloods that the teen crimefighter got away. When Static dug himself out, he noticed D-Struct left behind something, his journal. After reading the book, the teen hero now understood his foe's motives and decided to help D-Struct save his dad. until the battle literally spilled into their hideout. The Bloods realized they had been duped: the rematch was a ruse intended for D-Struct to covertly lead Static to the gang's hideout. D-Struct and Static easily defeated the Bloods and rescued the former's father. Though happy to be reunited, Damon and his dad knew that they couldn't remain in Dakota after defying the Paris Bloods. So, they decided to move to Louisville, Kentucky, far away from the gang's influence. Before departing, Damon thanked Static for his help and said he'd return to Dakota someday. About a year later, Damon Briggs got his high school diploma and now needed a job, which he learned were plentiful back in Dakota. He used all his contacts including Static to try to get some leads. Static did one better by convincing the high tech vigilante Hardware that Damon would make a great intern at Hard Co., a new research firm owned by Curtis Metcalf (secretly Hardware). Damon's first day at Hard Co. went decently despite the hectic office pace and his boss, Mr. Metcalf, being a bit of a jerk. However, Damon's day went sour after work when he was ambushed by soldiers from the U.S. government agency known as COVERT. The soldiers were on a campaign to capture Bang Babies like Damon, whom the U.S. government believed a national security risk due to intelligence from COVERT's own leader, Seven Pallaton. Changing into his monster form, D-Struct fought valiantly against his assailants, but was overcome by their energy siphoning weaponry. Fortunately, Hardware was investigating the Bang Baby kidnappings and arrived in time to free D-Struct and defeat COVERT. The vigilante later "persuaded" Pallaton and the misinformed government officials to call off the Bang Baby hunt. Apart from the COVERT attack, Damon Briggs' life back in Dakota has gone very well and he has become a valued member of Hard Co. In fact, Metcalf revealed to Damon that he is Hardware. Thus, Damon Briggs, who once had no hope, now has a bright future before him. Comments: D-Struct was created by Kurt Busiek (Conan, Astro City) and Neil Vokes. Profile provided by Fred Weaver.